The 2014 NAMM was like most shows, some interesting sights, great music, changes and New Gear! One of the first things I found was the New Mac Pro!!! A few lucky booths had them. Corning Optical Cables was one of them. Coring has been makes optical cables for years for heavy duty industrial applications like undersea cables. Now they have made USB 3.0 and Thunderbolt cables for music, video and computer applications. Thunderbolt™ Optical Cables by Corning unleash the brilliance of light to connect computers and devices at incredible speed and over longer distances. They’re thin, light and remarkably tough — Optical Cables by Corning can be bent, squeezed, and tangled. Remember ADAT optical cables? The slightest bend would cause them not to work!!! These cables can be bent or tied into a knot without a problem. Besides being the MIDIGuy, I'm also a guitar player so I had to share some of these pictures!! One of Hendrick's Strats!! He gave it to his Roadie in 1970! Lucky guy! Clapton's 1980s Signature Guitar played by him. Hard to look at!! Ritchie Blackmore's CBS era Strats, he destroyed on stage with Rainbow! Saw this last year and was waiting for it's release and now BITWIG GmbH announced the launch of BITWIG STUDIO for March 26th, 2014. BITWIG STUDIO is a new and innovative music creation, recording, and performance software that supports all three major computing platforms: Windows, Mac OS X, and Linux. Combining traditional arrangement sequencing with modern performance-oriented clip launching workflows, In fact, Verson 1 lays the groundwork for a truly incredible program see the details at the bottom of this. The programmers are from Ableton so it looks a bit like Live and has a similar design but there's some big difference. BITWIG STUDIO offers a state-of-the-art audio engine under the hood, with full multi-processing support, a unified modulation system, 32/64-bit VST plugin bridging, and VST plugin crash protection. BITWIG STUDIO comes with over 50 included devices. Conventional Instruments (Polysynth, FM-4, Organ, Sampler and analog-style Drum Modules) and FX (Delays, Equalizers, Compressors), as well as Container devices (to build parallel instrument or effect chains), Note FX, and Modulator devices (additional controllers like LFOs, envelope followers and step sequencers for modulating any other device). Extend this collection with your favorite VST effects and instruments, and use them side by side with BITWIG STUDIO internal devices. While version 1 is an impressive debut, Version 2 is already announced and adds some never before features that will change how music is made on a computer. The programing for these features are already included in version 1. What are these features? Anyone current trying to make music with a computer runs into three major problems. 1. There's only one user who is creating the music at a time with the software. Everyone else is watching. This is one reason why computer based music sounds "one dimensional". It's all My Ideas not Our Ideas. Not in the next version. You and your band/writing partners can jam on the same document using different computers in real time. A real "computer band" composing in real time!t Interaction between players is now possible, just like with a live band. That's how the best music ever recorded was done. 2. It's impossible to interactively compose music with others with existing software. With the next version you can collaborate with anyone anywhere at anytime on the same document without worrying about being on the wrong version of software or song. BitWig keeps track of everything so your changes and your partners are all there and in sync. 3. You can't change the software to suit your want or needs. You have to wait for the software to made, if ever, that works for you. You can now create your own instruments, effects or modify existing ones to do what you need or want them to do. What if you're not a programmer? No problem you can find one to do it for you. Plus there's gong to be lots of other people making instruments and effects so you can find exactly what you want. This little booth had a couple of interesting synths. One current, EINKLANG and a alpha version VIER. The EINKLANG is designed for those who want a ground breaking synth and to tweak with ease. Vier is for the hard cord synth programmer tho it's easy for anyone to use. EINKLANG is a synthesizer following a complete new paradigm of sound generation. Instead of synthesizing sounds like traditional synthesizers according to a set of technical parameters (i.e. amplitudes, frequencies, spectra...), EINKLANG re-synthesizes sounds using instrument models. These instrument models can not only be tweaked directly in their musical parameters (i.e. loudness, pitch, timbre...) but also be morphed from one tone color to another. These key features allow the user to think in plain sounds rather than mathematical equations and to control EINKLANG with few but very powerful musical parameters. The instrument models are based on Artificial Intelligence Studio Technology (AIST) that allows synthesizers to understand the structures of sounds, and remember specific nuances of different instruments. So the musician can concentrate on musical aspects, while the synthesizer does all of the underlying technical processing. EINKLANG is the first synthesizer to introduce a strong synesthetic link between sound and color. It enables you to morph one sound into any other, just as white light is able to travel through the entire color spectrum in additive color synthesis. While using the morphing field, all GUI controls adapt in color. When you morph three tone colors together as one, everything is illuminated in pure white. It's all in EINKLANG. There's also several expander packs for it as well. • Contains Einklang + RGB and the Black and White tone packs. The alpha version of VIER we saw is a 4 Oscillator Analog Modeling Synth. Each Oscillator is a complete synth with filters, envelopes, etc. You can draw the routing to any part of the synth for complete control. For example you can take the 1st filter and route it to the 4th LFO plus there's controls for how the routing works. A very interesting tool for sound designers and synth programmers. However it's easy for any one to use. It should be available this summer for around $79. Sounds very good! Fender had all sorts of new offerings this year. Being their 60th anniversary, they made a New version of the 1954 Strat to celebrate. The show stopper was the Fender Custom Shop Hermitage Jeweled Stratocaster crafted by Master Builder Yuriy Shishkov. 1007 Gems 556 Diamonds 281Emeralds Or was it Todd Krause's Cubic Zirconium Diamond Topped Swarovski Crystal Covered Telecaster guitar for the 2014 NAMM Show? Or was one of the......? While most people think of Fender as just a Strat, there's other models as well. Fender's Kurt Cobain Jaguar® is a new-looking version of the battered and highly unusual 1965 Jaguar that Cobain wielded during the heady early-'90s era when Nirvana ruled rock and led a musically stunning and culturally subversive movement. Features include an alder body, bound fingerboard with pearloid dot markers, Stratocaster® headstock shape with 1950s-style "spaghetti" logo, DiMarzio® humbucking DP103 PAF 36th Anniversary neck pickup and DP100 Super Distortion bridge pickup, triple knurled "chrome-dome" knob configuration (volume, volume, tone), three-position toggle switch, black chrome Adjusto-Matic™ bridge and Gotoh® sealed tuners. Available in right- and left-handed versions. Accessories include a black textured vinyl hard-shell case and an exclusive Fender Kurt Cobain book with photos and commentary by Charles Peterson and an insightful interview with Nirvana guitar tech Earnie Bailey. MSRP of $1619.99. This is an interesting instrument, designed by Dr. Lippold Haken and manufactured by Haken Audio, the Continuum Fingerboard is a musical instrument that allows unprecedented realtime performance control. With a greater pitch range than a traditional 88 note Midi keyboard, the Continuum offers realtime continuous control in three dimensions for every finger that is placed on the playing surface. The Continuum Fingerboard contains an audio DSP that acts as a powerful internal sound engine delivering analog and digital audio outputs. The Internal Sounds are specially designed and are idiosyncratic to the Continuum Fingerboard, in the sense that they take full advantage of the Continuum's three dimensional polyphonic playing surface. The Internal Sounds are implemented using a variety of synthesis techniques including FM, physical modeling, timbre morphing, pitch shifting, additive synthesis, waveshaping, convolution, and classical synthesis. These same techniques are the basis for the user programmable EaganMatrix Sythn Engine. The specialized sound set for the Continuum Fingerboard was prototyped by Edmund Eagan in Kyma, Symbolic Sound's fantastic sound design, exploration, and performance environment. The prototypes were then hand coded by Lippold Haken for the Continuum Fingerboard's DSP. We saw this and thought what a cool synth!!!! But it's not. Will they make a synth based on this sound engine? We don't know and they won't say. In any case you make some amazing sounds with it. Designed by BT and developed by iZotope, BreakTweaker is not just a drum machine: it's a drum sculpting and beat sequencing environment that blurs the line between rhythm and melody. Give your beats an ever-evolving depth that gets better the longer they play. Use rhythmic slicing to drive everything from pitched melodic lines to sweeping rhythmic overtures. Top it all off with the best drum sample library in existence, curated by BT, iZotope, and top producers today. Explore a new era of rhythmic possibilities with this forward-thinking and forward-sounding instrument. includes BreakTweaker plus all 3 BreakTweaker Expansions: Vintage Machines, Cinematic Textures, and Kicks & Snared by Beatport Sounds.For a bit more money you get a lot more! 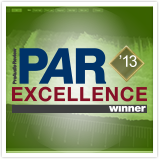 A second PAR Excellence Award for the Ozone family, honoring Ozone 5’s Advanced version. 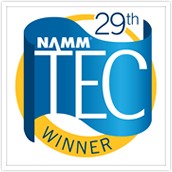 Insight wins for technical excellence in the category of Ancillary Equipment. Korg is debuted the RK-100S synth/controller for the 30th anniversary of the original RK-100. Korg's latest keytar is housed in a solid wood body and is battery powered, offering a number of additional updates from the original model. Equipped with a full palate of keyboard sounds from the built-in microKORG XL+ engine, it enables users to perform in a wide variety of music genres wherever inspiration may strike. It also functions as a USB/MIDI controller, as well as a vocoder. There are 200 programs available in the onboard MMT sound generation system, including a broad range of oscillator algorithms such as the characteristic sawtooth and square waves found in analog synthesizers, plus formant waveforms, noise, and classic PCM/DWGS waveforms. In addition to the 37-note slim keyboard (as featured on the Korg MS-20 Mini), a short ribbon controller on the neck and a long ribbon controller in front of the key bed are included for controlling parameters such as pitch and filter. The long ribbon runs the entire length of the key bed and can also be used to play scales over three octaves. Also included is a built-in arpeggiator, with six arpeggios available. Notes in the arpeggiator can be individually switched on/off, for even more rhythmic variation. The RK-100S comes equipped with a vocoder function that lets players use their voice, via the optional headset mic, to process the sound of the oscillator. The Korg RK-100S synth/controller runs on six AA batteries or the optional AD adaptor and is available in a choice of three colors: red, white and black. It will be available June 2014, with U.S. pricing to be announced shortly. Passport Music Software, LLC has acquired Passport DesignsTM intellectual property including software products; Encore® music notation, MusicTime Deluxe® music notation and MasterTracks® Pro midi sequencing as well as other assets from Lyrrus, Inc, dba Gvox. They brought back the old cartoon characters and more! Encore and MusicTime Deluxe runs of Mac OSX 10.3 or higher and Windows XP or higher. Master Tracks Pro runs on Windows 98, 2000, Me or XP. There's also a French language verion of Encore available. Propellerhead never stops working to make Reason better and better. Part of that process is public beta testing where you help us evaluate the latest version to make sure everything's as solid and awesome as we demand it to be. Recently they've opened up the beta testing period for Reason 7.1 and Reason Essentials 2.1. Sign up for the beta to get download access to the latest builds. Believe us, searching for bugs in your favorite music software is a whole lot more fun than searching for bugs under your kitchen counter. To participate, you must have a license for Reason 7 or Reason Essentials 2. ReCompose is planning to release a new product, called "Liquid Notes for Live", by at latest February 18, 2014. Technically, this product is a MIDI effect of Liquid Notes for Ableton Live 9 and behaves similar to a plugin. It comes with all the features known to you from the stand-alone version of Liquid Notes, yet integrates directly in the DAW which eliminates the need to export / import MIDI files between the two applications. This is a major improvement of the workflow, and is the single most requested feature for Liquid Notes. It gives users of Live 9 the power and intelligence of multi-track MIDI-editing tool for harmony & melody directly in the DAW, and enables any output directly to be rendered from MIDI to audio to any software or hardware that accepts MIDI input - the possibilities are big. Every years there's a string of booths showing old school analog synths with lots of patch cables! This year was a little different, there was some digital synths, cables, stompboxes and effects as well. Wire World Pro Audio who make high end audio cables (used to make the latest re-mastering of The Beatles catalog by renowned Mastering Engineer Greg Calbi),stg sound labs (they handmake synth modules for Moog frames and others), Hexinverter.net (For the Built It Yourselfers, they sell just the boards, you need to supply the rest) and The Harvestman (Seattle, WA manufacturer of digital synthesizer modules that are compatible with Doepfer-format synthesizer modules and enclosures) were some of the manufacturers. Since 1993 they have been making MIDI guitar controllers. The Starr Labs Ztar MIDI Guitar is a fast, reliable MIDI controller designed specifically for guitarists. Short string triggers are provided to capture MIDI velocity and string-muting from every nuance of your right-hand technique whether using fingers or a flatpick. Starting with these basics, the Ztar offers enhancements that can extend your musical expression. Because the fingerboard is scanned by a fast internal computer, it is possible to also play more than one-note-per-string, our "PolyMode". This allows playing cluster voicings, chords, and other techniques that were formerly in the realm of keyboardists only. When the fully touch-sensitive fingerboard is played in its Tapping Mode an entire world of two-hand performance opens up. There is no more expressive MIDI instrument for the tapping player. The StringTriggers, while normally used for simply strumming and picking the notes, may also apply simultaneously any MIDI effect such as ModWheel for added variety in your sound. A complement of Expression Pads, Pots, Ribbons, Pedals, and Breath control are often added to the Ztar that open a world of MIDI control. Each Pad, Pot, etc., may be programmed to send 8 separate events whether all together like a chord, all in a timed sequence, latched on/off, or single-stepped. Notes, chords, sequences, MIDI EFX, can easily be summoned and your imagination is the only limit. The iTar is designed for musicians, guitar heroes, electronic artists, iPad junkies and hackers looking for a fun and powerful tool that is also extremely portable. At it’s heart the device is a button-based guitar fretboard (Starr Labs patented fingerboard) integrated with a dock for the iPad which will transform the tablet into a 21st century musical instrument they call the iTar ™. An application they are developing for the iPad will provide the iTar with virtual strings that will emulate the strumming action of a real guitar. The application will also allow users to create custom layouts of playing surfaces for the strumming hand. The iPad creates the ability to store an endless amount of virtual playing set-ups for the user. If you want strumming bars ( strings ) an X/Y control pad, 2 joysticks and 5 knobs, you can have it. If you want to trigger the fingerboard without strumming six strings, you can do that as well with a giant tapping surface on the iPad screen. The pairing of our fingerboard also allows users to have tactile control over other third party applications like synthesizers and samplers. It can also be used as a simple button matrix for use with other music applications. Technically speaking the iTar will be made of a high impact plastic that will withstand the bumps and bangs of it’s portable nature and due to it’s modular design, will break down easily for travel and storage. The fingerboard will be USB 2.0 bus powered via the iPad itself so there will be no need for batteries or clumsy wall warts. The fingerboard is six strings wide and 24 frets long and every note is touch-sensitive. An external MIDI connector, extended-life battery, and high quality speakers are planned options. We were also busy at NAMM getting more manufacturers. 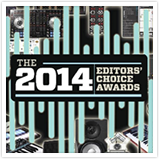 We're adding Avid, JBL, Kurzweil, Line 6, Nord, Novation, Presonus, Tannoy, and more! When you're looking for gear be sure to check out site or email us for great deals and service.